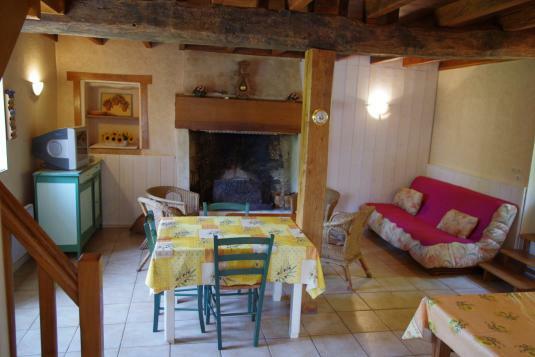 Charming cottage built specially insulated for your holidays in the Vendee. Your vacation rental is a detached house; furnished of tourism 2 stars 6 people (9 people under certain conditions), located near the village of Sérigné where nature and peace are one. The Vigneronde the cottage awaits you for an unforgettable stay in South Vendee, in a warm and comfortable. The proximity of the Wine Route Vendeans (fiefs) makes the perfect place to explore the beautiful Vendee villages and splendid sites and the Marais Poitevin Vouvant or clearance light Vendée on the Atlantic with those long beautiful sandy beaches in sunny vendee. The cottage is located in Vigneronde the lush flowers and greenery, in the Vendée. The villages of Vouvant Foussais Payré, nicely nestled deep in the forest Mervent, near the Green Venice, have a natural appeal for a stay in the countryside: river, wilderness, forest, scenic area, etc... And ensure the reception and stay of tourists in a protected environment. Located 40 minutes from La Tranche sur Mer, La Rochelle, the theme park Puy du Fou, 90 minutes of Sables d'Olonne, a time of Ile de Noirmoutier / city of Nantes. In this cottage cool and quiet pets are allowed. You can pay by check holiday. ► A large living room with two tables, sofa bed, television. ► A kitchen with oven and gas hob, microwave, toaster, coffee maker, refrigerator-freezer. ► A shower and a separate shower room. ► Upstairs bedroom with 1 bed 2 persons bed 1 person and 1 plus a baby bed. ► Upstairs bedroom with 1 bed for 2 people and 2 beds 1 person. A lot of outside space, two terraces, private area, meadow and wood (large unfenced).Private parking available. All the shops are in town to Fontenay le Comte, 8 km, beef, tobacco, pharmacy, doctor, hairdresser, mechanic or a local supermarket in the small village of Sérigné, and even opened a bakery on Sunday morning in the village of Bourneau.